About time to replace wife's turbo Sonata but everything she has driven thus far has bored her as not being 'quick and nimble'. I have not taken her to drive the Alfa being worried she would fall in love and it might be a maintenance problem. It certainly has the size and configuration and sure gets good reviews. Highly recommended!!! Very nimble handling, for a 4 door sedan. Beautiful looks inside, and out. I really like the design, nothing like it out there. The emblem is so iconic, much history behind it. Too bad I only had it for a few months before a road hazard totalled it. I do wish it came with a manual trans. Can't your wife drive? I'm curious just what you have to do with any decision about her car. France was crawling with Giulia's two summers ago. My wife thought I was ogling the women. Yeah, them too. I believe every Giulia tested by journalists, except one, that I've read/watched, has had issues. I would run away. They look great but all signs point to them having (at best) a few teething issues. Try a new Honda Accord 2.0T - it'll be practically as quick, well-built, comes with a manual or a 10AT, has easy dealer access and is supposed to drive quite well. I drove one for about a 30 minute tester and prefer it to my 328i. It is on my list as a consideration for the next daily. A few of the magazines have had some issues with early models and most of the problems were electrical gremlins. According to Alfa, they had some software issues that they addressed and I have not seen any issues addressed by the magazines in subsequent tests. 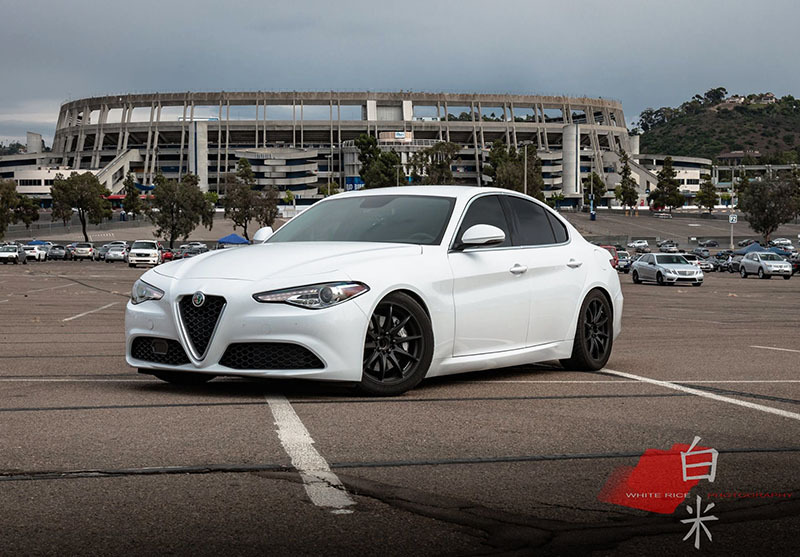 I would however go to a Giulia forum and see what are the common issues with the car if any after software updates. I still wish they had a manual, but if my choices are cars that only offer an auto, I really liked the car. They are priced very competitively in the segment. But if you are worried longevity, you could always take the lease and check it out. I bought a Giulia Ti Q4 back in October, currently has 5200 miles on it as we drove from here (MI) to Houston for Thanksgiving in it. We traded in our '14 Abarth cabrio for it. I've had a long list of cars/sedans over the years, IMHO it drives better than the 3 series and A4/S4 hands down. We've had some snow this year, and even with the 19" wheels and the Pirelli all seasons it's equally as good as my Audi's have been. I put a Madness Lusso stainless exhaust on it about a week after I got it, so now it sounds the way I think it should've . I plan on doing ECU tuning in the very near future as well. I've had zero issues with it, no gremlins, or anything else. Wow, that looks amazing! 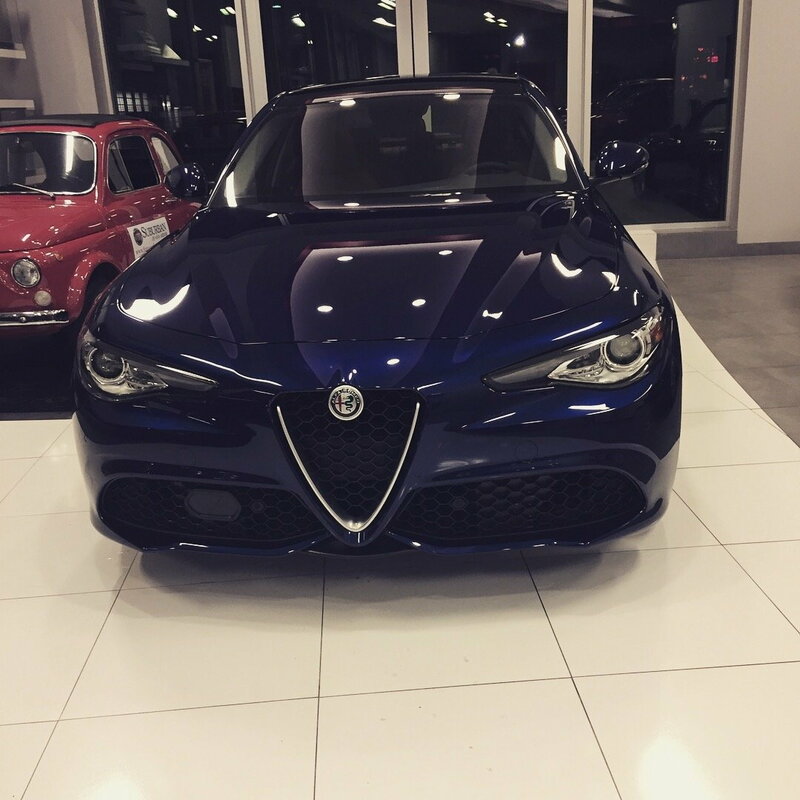 Midnight blue is a good choice and classic Alfa color. Had for a week before it was lowered on the wheels. - I tracked mine and the brakes never faded. Handles just as competently as a S2000. Gearbox always seemed to know the right gear to be in. - Back seats that fold down -- QV doesn't have this, for some dumb reason. - Very comfortable and compliant ride, while also being a great handling car. - Car yells and prevents you from doing a lot. Leave the car on with the keyfob, and the car chimes endlessly. Unbuckled seat belt... chime. Want to move the car with the door open, nope. - Again, TC cannot be turned off. This. Kills. A lot. Of. Fun. - Some minor Italian fit and finish issues... such as the tow cover doesn't like staying affixed. Most entertaining sedan available from my test drives. BTW, fixed rear seats are not uncommon on high performance models as extra lateral support is desired. I am thinking of waiting for a better inventory of '18s rather than get the small discount on a '17. If nothing else the inclusion of phone play features is good and may help future resale. Have yet to make a recent visit to the Cad dealer but with a target of 50K it may not be a good choice for us.